A new carpet can make even the dullest office space vibrant and inviting. However, since office carpets get more foot traffic than residential ones, their upkeep needs to be regular as well. A vacuum job will do nothing but clear debris on top of the fibers. A professional carpet cleaning service will go in deeper and make it spotless inside and out. The first impression your office makes on clients is usually the last. If the carpet you have in the lobby has seen better days, what will that say about your work ethic? If you don’t care about hygiene, chances are clients might think you won’t take them seriously either. A well-maintained and clean carpet will not only enhance aesthetics, but will also bring the décor together. That is the formula to making a great first impression! Carpet fibers can retain dust, dirt and debris for years. With the constant foot traffic, that dirt finds its way into the air your staff and clients breathe in. The result can be odors and even respiratory issues that your business cannot afford. Using harsh cleaners for a quick cleaning job will do nothing but damage your expensive carpet and add toxic fumes to the dirt. Professional commercial carpet cleaning services are more effective at removing embedded dirt than a simple cleaner. The cleaning products they use are not harmful for health. Regular maintenance jobs will ensure your carpet remains clean and dirt-free. The result will be cleaner air in your office and a healthier staff. Quick cleaning jobs are notorious for leaving behind stains that cannot be removed. You might find end up replacing your office carpets if you don’t hire professional cleaners to clean it regularly. Besides ensuring the carpet does not have any ugly marks, a regular cleaning job will ensure it remains odor free as well. In fact, the cleaning products they use have a pleasant scent that is aromatic and can soothe the senses. That is much better than using toxic bleaching agents that can ruin those delicate fibers as well. Hiring commercial carpet cleaners for scheduled cleaning jobs is more cost efficient than replacing expensive office carpets. Before starting, you will be given a list of estimates for each cleaning task which can be customized according to your needs. In fact, you can also reduce the cost per cleaning if you hire them to clean your carpets regularly. 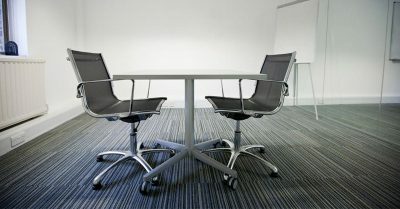 The result will be cleaner carpets, a healthier office environment and lower cleaning costs. If you are in search of a professional office carpet cleaning service that can provide these services, contact Extra Hands today at 816-396-6234. You can also get a free consultation if you sign up today. We offer a broad range of expertise that can keep your office carpets look as good as new.